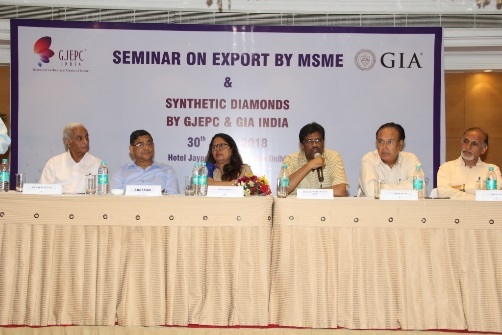 Ms. Nirupa Bhatt, Managing Director of GIA India & Middle East presented a seminar on “Synthetic Diamonds” in New Delhi, on June 30, 2018 at an event organised by Gems and Jewellery Export Promotion Council (GJEPC). Mr. K. K. Duggal, Regional Director of Trade & Policy, GJEPC. 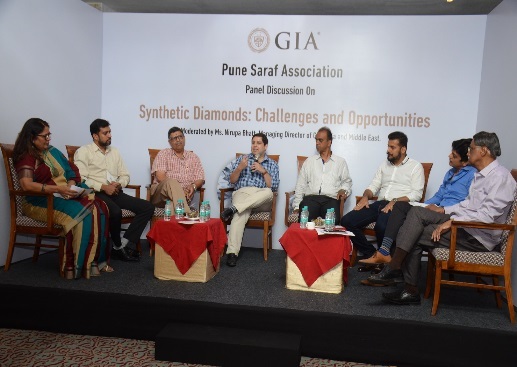 GIA India held a panel discussion on “Synthetic Diamonds: Challenges and Opportunities” at The Pride Hotel in Pune, on May 14, 2018. 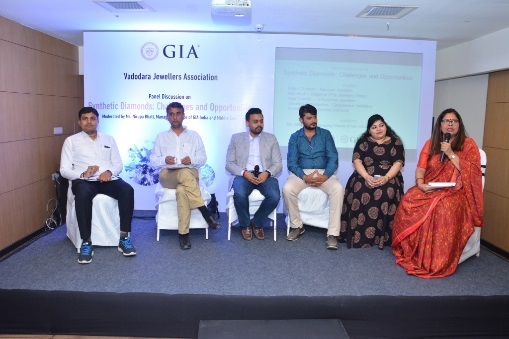 Ms. Nirupa Bhatt, Managing Director of GIA India and Middle East, moderated the discussion with speakers including Mr. Devendra Pednekar, S. B. Pednekar Jewellers; Mr. Milind Marathe, Pranaav Marathe Jewellers; Mr. Akshay Gadgil, PNG Diamonds & Gold; Mr. Rakesh Oswal, Fojmal Jitaji; Mr. Vipul Ashtekar, Krishna Rajaram Ashtekar Jewellers; Mr. Shailesh Ranka, Ranka Jewellers and Mr. Mahesh Sagar, Sagar Jewellers. 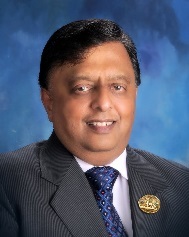 Mr. Fatechand Ranka, President of Pune Saraf Association and Managing Director of Ranka Jewellers. GIA India held a panel discussion on “Synthetic Diamonds: Challenges and Opportunities” at Crystal Palace Hotel, Meerut, on Apr. 11, 2018. Ms. Nirupa Bhatt, Managing Director of GIA India and Middle East, moderated the discussion with speakers including Mr. Shailendra Singh, Asst. Commissioner, District Industries Centre – Uttar Pradesh, Mr. Ashok Seth of Seth Jewellers and Chairman, Northern Region, GJEPC; Mr. Ravi Agrawal of Raghunandan Prasad Saraf, Mr. Akash Manglik of Bhagat Jewellers and Mr. K. K. Duggal, Regional Director of Trade & Policy, GJEPC. 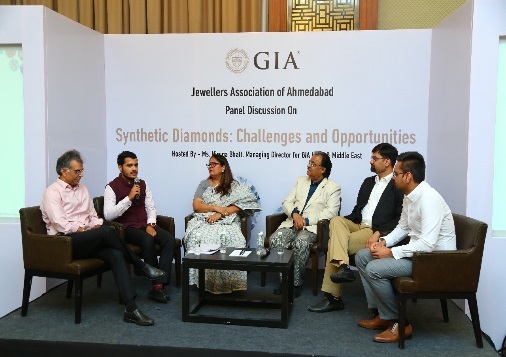 GIA India held a panel discussion on “Synthetic Diamonds: Challenges and Opportunities” at Hampton by Hilton, Vadodara, on Apr. 3, 2018. Ms. Nirupa Bhatt, Managing Director of GIA India and Middle East, moderated the discussion with speakers including Mr. Ketan Chokshi of Narayan Jewellers, Mr. Paresh Patel of Krishna Diamonds, Mr. Atul Shah of Dageena (The Jewellery Shop), Ms. Devashree Gandevikar of Gandevikar Jewellers and Mr. Neel Chokshi of S. Kanjibhai Jewellers. 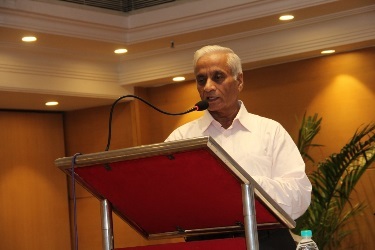 Mr. Kishore Chokshi, President of Vadodara Jewellers Association. 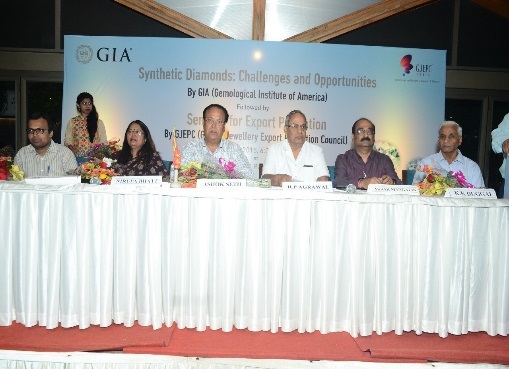 GIA India held a panel discussion on “Synthetic Diamonds: Challenges and Opportunities” at Hyatt, Ahmedabad, on Mar. 5, 2018. Ms. Nirupa Bhatt, Managing Director of GIA India and Middle East, moderated the discussion with speakers including Mr. Manoj Soni of A.B. Jewels, Mr. Raj Zaveri of Zaveri & Co., Mr. Rohit Choksi of ‎Ishwarlal Harjivandas Jewellers and President of the Jewellers Association Ahmedabad, Mr. Jigar Soni of N. S. Jewels and Secretary of the Jewellers Association Ahmedabad and Mr. Kailesh Kabra of K. K. Jewels.